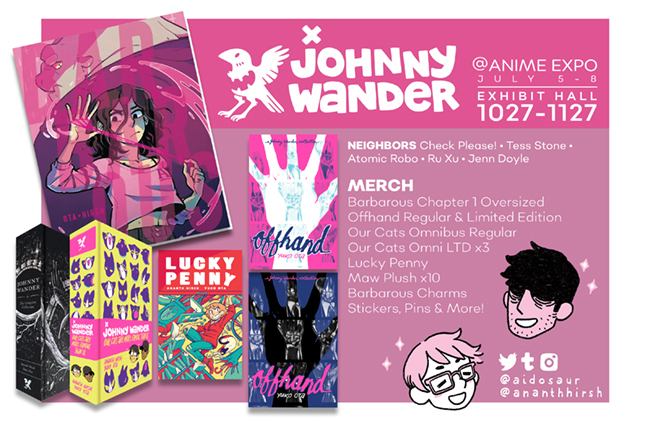 Johnny Wander - Anime Expo 2018! Exhibit Hall Booth 1027-1127! Anime Expo 2018! Exhibit Hall Booth 1027-1127! Hey everyone! We're updating to let you know that we'll be at Anime Expo 2018, in the EXHIBIT HALL, Booth 1027-1127! We'll have everything listed above, but limited quantities of the LTD Omnibus and Maw Plushes! We hope to see you there!